Authorities on Tuesday sealed commercial hub of Lal Chowk in Srinagar city to prevent a march called by the Joint Resistance Leadership (JRL) against the killing spree. 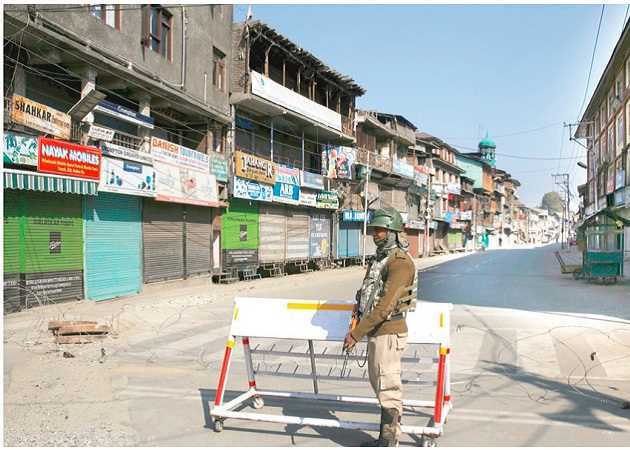 Last evening, the police had issued an advisory, asking commuters to use an alternate route as “the stretch of road from Amira Kadal to Regal Chowk will be blocked for traffic”. An eye witness said that barricades have been erected by the police at Amira Kadal and the Regal Chowk to prevent any movement towards the historic Lal Chowk. Jammu and Kashmir Liberation Front (JKLF) chief Yasin Malik appeared in Lal Chowk on Tuesday morning after remaining in hiding to prevent his arrest ahead of JRL march to the city centre. Joint Resistance Leadership (JRL) has called for a march to Lal Chowk today to protest “killing spree and Kulgam carnage”. “After evading arrest for two days, Yasin Malik managed to reach Lal Chowk this morning. He arrived at Masjid Sharif Koker Bazar before Nimaz-e-Fajr,” said a spokesman. Seven civilians were killed in a blast at the site of a gunfight in Laroo village of south Kashmir’s Kulgam district on Sunday, triggering outrage.